One thing people tell us is, they want to learn how to soften feet fast. As a rule, you want to smooth the calluses off over time to prevent painful over filed heels. If you take too much off, you won’t be able to wear those cute shoes because your feet will hurt too much to even stand up. But I understand if you have a hot date or party coming up and you have a new pair of slingbacks to wear. Ideally, you should go to a podiatrist or a pedicurist and have a pedicure with a paraffin treatment but not everyone has access to those services. You can make a big difference by doing a home treatment to soften your feet fast. The longer time you have to get ready for your event better. 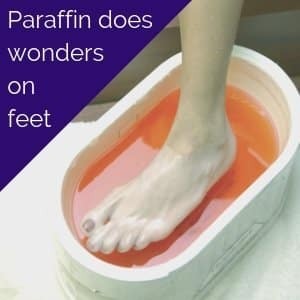 Initially, start by plugging in your paraffin bath and have it ready-to-use right after your file your feet. Depending on your unit it might take up to 2 hours. I set mine up on the kitchen floor just in case there are any little spills from dipping my feet. Soak your feet in a foot tub with a callus softening foot soak. Do this for the recommended amount of time on the package of the heel softening foot soak. After that file your heels for a few minutes. Massage lotion or a cream made for cracked heels into your feet for a few minutes. Get your paraffin pot ready and dip your foot into the pot. Dip it repeatedly 5 or 6 times. Put the plastic baggy over the paraffin covered foot. Put your regular sock over the plastic bag with the paraffin in it. This keeps the paraffin warm and keeps the baggy on the foot. Do the same with other foot. Sit with these on for up to an hour or however long you can stand it. When you take it off dispose of the baggy with the old paraffin in it. Before bed reapply lotion and then put your moisture infused socks or heel sleeve on and keep them on throughout the night. On alternate days apply lotion 2 times daily and wear your moister socks or heels sleeves. Do this every other day until your event. I only have 2 hours before my event!!! You can also do this if you have one night to prepare or even 2 hours to prepare. You would just have to shorten the steps and skip the moisture sock or heel sleeve. It’s daunting to have to go out in public if you are self-conscious about your feet. With a bit of work, you can get decent results a feel better about wearing those cute shoes.